With a City of more than 20,000 residents and visitors topping 1 million, effective communication is essential to keep all informed of available services, upcoming events, and City policies. An informed public contributes to the quality of life of the community. The City of Sunny Isles Beach utilizes many different forms of new and traditional media to stay connected to the public, including: online, television, radio, and print. SIBAlert enables citizens to receive accurate and up-to-date notices and warnings from the City of Sunny Isles Beach during critical incidents and emergencies. Notifications are sent based on location through a variety of methods including phone calls, SMS text messages, emails and a mobile application. You can choose any and all methods of alerts you would like to receive. To get the most current information conveniently delivered to your inbox, sign up for our free eSIBi notification service, or electronic Sunny Isles Beach information. You may subscribe to categories pertaining to your own interests, and of course, unsubscribe at any time. A list of commonly asked questions that you can find the answer to right on our website. If you don’t find the answer to your question, you can email City Hall and your inquiry will be answered by a member of the City Staff as soon as possible. Enhancing our communication resources, we now utilize social media to communicate with residents and visitors. Follow us on Twitter and Instagram and “like” us on Facebook. Stay up to date with upcoming events, important announcements and traffic alerts. Social media is a great way to stay connected to your community and learn about new services and programs offered by the City. Commission Meetings take place the third Thursday of every month (except August) and are broadcast live on SIB-TV Channel 77. You can also stream these Commission Meetings live on our website. On the same page you will find an archive of past commission meetings available to watch. We take photos at many of the events hosted by the City. These photos are later edited and uploaded to our photo gallery (hosted by Image Event). Look through past events and download any pictures you want to keep! Stay up to date with the latest news in our online “Sunny News” section. You can find our most recent Sunny News articles on the homepage of our website, and all of the articles are kept in our archives. 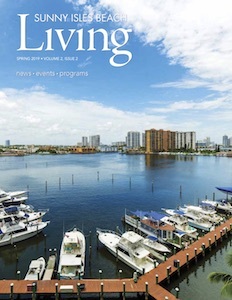 Stay up to date on the latest organizational news around the Sunny Isles Beach Community. This news is only offered online. This is a 24/7 broadcast on Atlantic Broadband Channel 77 (or 107.5 in digital) and AT&T U-verse Channel 99. Beach access, parks cultural events and City sponsored concerts, calendar of events and meetings, library programming, traffic information and Community Shuttle pick up locations are found here. City Commission scheduled meetings and tape delay broadcasts are also available. Our production team records City events, concerts, and activities and produces them into short recaps, promos, full concert shows, or informational pieces. These videos are broadcast on SIB-TV Channel 77 and can be found on our YouTube Channel. A wealth of information is found at 1120 AM. Listen for information about events, City services, and City parks. This quarterly magazine, covers City Services, information on parks and beaches and our entire Calendar of Programs and Events, inclusive of three months of classes, events, youth and adult activities- including sports teams for all ages. These activities are held in the Pelican Community Park and in other City Parks. Nearby hotels, services offered, and information which new residents and tourists can use to answer questions are included. This publication is also a great marketing tool for the City used by realtors and travel planners promoting our City to the world. Mailed to every household, this publication comes out monthly announcing programs and events, offering a glimpse of City services and current important resident information.